Primary Natural Resources tin, natural gas, petroleum, zinc. BOLIVIA IS A COMPLEX and fascinating country. Located in the center of South America, it shares borders with five countries: ARGENTINA, BRAZIL, CHILE, PARAGUAY, and PERU. After the War of the Pacific (1879–84) against Chile, Bolivia lost access to the PACIFIC OCEAN and became, along with Paraguay, one of the two LANDLOCKED states in the Americas. Since then, the question of Bolivia’s access to the sea has remained a central diplomatic and economic issue in the region. In addition, in 1935, during the Chaco War against Paraguay, Bolivia lost substantial claims to the Chaco territory. 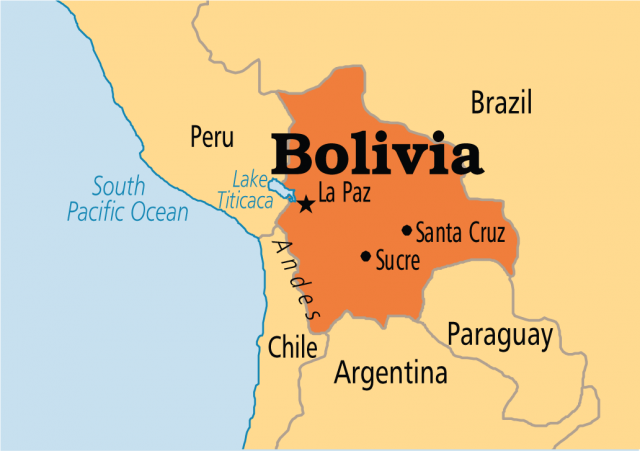 Bolivia is a contradictory country. While it is extremely rich in natural resources, including some of the largest reserves of natural gas and tin, it has acute social and economic tensions. The country’s economic vulnerability, its cycles of boom-and-bust, and its traditional dependence on the external market have intensified social inequality. At the beginning of the 21st century, with two-thirds of the country’s population living in poverty, a third of which falls below the poverty level, Bolivia is one of the poorest nations on the continent. After a short period of economic growth in the 1990s, the economy slowed down as result of the Asian economic crisis, and social and political tensions have consistently increased. Geography and the environment have shaped the history of Bolivia. Bolivia has three distinctive geographical regions: the highlands or ALTIPLANO (high plateau), the transitional sub-Andean, and the tropical lowlands. The majority of the Bolivian population has historically lived in the Altiplano, between 12,000 ft (3,657 m) and 13,000 ft (3,962 m) above sea level. The altitude has posed enormous challenges. In pre-Columbian times, the Andean poor soils, high altitude, and harsh climate forced the population to develop new agricultural techniques and domesticate the American cameloids (llama and alpaca). On the eve of the Spanish conquest, the Bolivian Andes produced about 200 kinds of potatoes. The highlands have provided essential mineral resources including one of the richest silver mines in the world, Potosí. The Altiplano also has the world’s highest navigable lake, Lake TITICACA (12, 483 ft or 3,805 m), which Bolivia shares with Peru. The valleys of the transitional sub- Andean region have been a significant source of agricultural products and the basis of a peasant tradition. Despite the image of Bolivia as an Andean country, about two-thirds of its territory is tropical or semitropical. Access to the tropical lowlands, however, has been traditionally difficult, limiting the demographic growth and the exploitation of economic resources. In the late 19th century, the exploitation of rubber created an economic boom in the area, and since the last decades of the 20th century, the development of commercial agriculture, including products such as sugar, cotton, and cattle, have promoted enormous growth. Today, the tropical regions and its major city, Santa Cruz de la Sierra, are among the fastest-growing areas in the country. Since the mid-1950s, Bolivia has become an increasingly urban country, and today about 62 percent of the population lives in cities. While Sucre is the official capital, La Paz is the de facto capital and the seat of the government. La Paz has an estimated population of 793,293 people, and El Alto, a former suburb of La Paz, has about 649,958 residents and an annual growth of 5.1 percent. Santa Cruz de La Sierra, located in the tropical eastern lowlands, has become in the last decades an important urban and economic center, and today it has an estimated population of 1,135,526 and an annual urban growth of 5.08 percent. Bolivia is a multiethnic society. About 55 percent of the population is considered of native origin, 30 percent of which is Quechua and 25 percent Aymara. The native heritage has shaped popular culture, traditions, folklore, festivals, language, and religious practices. Another 30 percent identified themselves as mestizo or cholos, an ambiguous category that refers both to people of mixed race as well as acculturated natives who live in urban environments, speak Spanish, and have abandoned native customs and dress. Only approximately 15 percent of the Bolivian population is classified as white.